The Road Traffic Act, 2010 and Road Traffic (No. 2 ) Act 2011 have brought about a comprehensive consolidation and updating of drink driving law in Ireland. (The Road Traffic Act, 2014 made some further amendments). From a legal perspective the prosecution of drink driving offences can be quite a technical area, and you are strongly advised to obtain legal advice if you are prosecuted for any drink driving offence. Let’s take a look at the state of affairs in 2017. 4.— (1) A person shall not drive or attempt to drive a mechanically propelled vehicle in a public place while he or she is under the influence of an intoxicant to such an extent as to be incapable of having proper control of the vehicle. (b) in case the person is a specified person, 20 milligrammes of alcohol per 100 millilitres of blood. (b) in case the person is a specified person, 27 milligrammes of alcohol per 100 millilitres of urine. (b) in case the person is a specified person, 9 microgrammes of alcohol per 100 millilitres of breath. (5) A person who contravenes this section commits an offence and is liable on summary conviction to a fine not exceeding €5,000 or to imprisonment for a term not exceeding 6 months or to both. (6) A person charged with an offence under this section may, in lieu of being found guilty of that offence, be found guilty of an offence under section 5 . (8) A member of the Garda Síochána may arrest without warrant a person who in the member’s opinion is committing or has committed an offence under this section. 5.— (1) A person commits an offence if, when in charge of a mechanically propelled vehicle in a public place with intent to drive or attempt to drive the vehicle (but not driving or attempting to drive it), he or she is under the influence of an intoxicant to such an extent as to be incapable of having proper control of the vehicle. (5) A person guilty of an offence under this section is liable on summary conviction to a fine not exceeding €5,000 or to imprisonment for a term not exceeding 6 months or to both. (6) A person charged with an offence under this section may, in lieu of being found guilty of that offence, be found guilty of an offence under section 4 . (8) In a prosecution for an offence under this section it shall be presumed that the defendant intended to drive or attempt to drive the vehicle concerned until he or she shows the contrary. (9) A person liable to be charged with an offence under this section shall not, by reference to the same occurrence, be liable to be charged under section 12 of the Licensing Act 1872 with the offence of being drunk while in charge, on a highway or other public place, of a carriage. (10) A member of the Garda Síochána may arrest without warrant a person who in the member’s opinion is committing or has committed an offence under this section. (f) is deemed under section 8 to be a specified person. Note: the definition of a specified person has been amended by section 9 of the Road Traffic (no. 2) act, 2011. The Road Traffic Act, 2010 has introduced a fixed penalty notice system for the first time for drink driving offences in section 29. (iii) where the member does not have such an apparatus with him or her, to remain at that place in his or her presence or in the presence of another member of the Garda Síochána until such an apparatus becomes available to him or her (for a period that does not exceed one hour) and to provide, by exhaling into the apparatus, a specimen of his or her breath in the manner indicated by the member. (2) A member of the Garda Síochána shall not make a requirement of a person under subsection (1)(b) where, in the opinion of the member or on the advice of a doctor or other medical personnel attending the scene of the event, such requirement would be prejudicial to the health of the person as a consequence of the person’s involvement in the event. (3) A person who refuses or fails to comply immediately with a requirement under this section commits an offence and is liable on summary conviction to a fine not exceeding €5,000 or to imprisonment for a term not exceeding 6 months or to both. (5) In a prosecution for an offence under section 4 , 5 or 6 it shall be presumed, until the contrary is shown, that an apparatus provided by a member of the Garda Síochána for the purpose of enabling a person to provide a specimen of breath under this section is an apparatus for indicating the presence of alcohol in the breath. (6) Section 1 (1) of the Probation of Offenders Act 1907 does not apply to an offence under this section. Section 9 is amended by Section 7, Road Traffic (No. 2) act, 2011. Mandatory breath testing involves the setting up of authorised checkpoints. 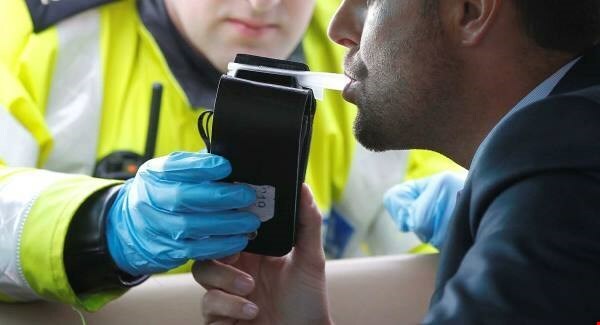 Once lawfully authorised anyone can be obliged to provide a breath test, and the Garda does not have to form any opinion, unlike in section 9 above where the Garda does have to form an opinion. The authorisation is a necessary proof in a case which involves section 10 and without an authorisation any arrest is probably unlawful and any evidence gathered inadmissible. The authorisation must specify the public place where the checkpoint will be set up. “checkpoint” means a checkpoint established under an authorisation. keep or leave it there until the person has complied with a requirement made of him or her under paragraph (a). commits an offence and is liable on summary conviction to a fine not exceeding €5,000 or to imprisonment for a term not exceeding 6 months or to both. (8) In a prosecution for an offence under section 4 it shall be presumed, until the contrary is shown, that an apparatus provided by a member of the Garda Síochána for the purpose of enabling a person to provide a specimen of breath under this section is an apparatus for indicating the presence of alcohol in the breath. (9) An authorisation or a copy expressing itself to be such authorisation shall, until the contrary is shown, be sufficient evidence in any proceedings under the Road Traffic Acts 1961 to 2010 of the facts stated in it, without proof of any signature on it or that the signatory was a person entitled under subsection (2) to sign it. Section 11 provides for preliminary impairment testing; this includes testing for drugs. 11.— (1) A member of the Garda Síochána, for the purposes of forming the opinion that a person in charge of a vehicle in a public place is under the influence of an intoxicant to such an extent as to be incapable of having proper control of the vehicle, if he or she considers it would assist him or her to form such opinion, may require the person to perform in the presence of the member or another member such impairment tests, in the manner indicated, in accordance with impairment test regulations, by the member or other member in whose presence the test is to be performed. (2) A member of the Garda Síochána in forming an opinion under subsection (1), where a test under subsection (1) is performed in the presence of another member, may take into account any advice or opinion given to him or her by the other member. (3) The Minister may prescribe the form of tests, indicating the manner and type of the tests, for the purposes of subsection (1). (4) A person who, without reasonable excuse, fails to comply with a requirement under subsection (1) commits an offence and is liable on summary conviction to a fine not exceeding €5,000 or to imprisonment for a term not exceeding 6 months or to both. Section 12 of the Road traffic Act, 2010 sets out the provisions to provide a specimen after a person has been arrested. This section provides for a specimen to be provided at a hospital, not just at a Garda station as was the case. A doctor or nurse can be used to obtain the sample. It is critically important that the person has been lawfully arrested; otherwise the demand for a specimen is unlawful. the member may make a requirement of the person under this paragraph in relation to the specimen other than that to which the first requirement related. (2) Subject to section 22 , a person who refuses or fails to comply immediately with a requirement under subsection (1)(a) commits an offence. (4) A person who commits an offence under this section is liable on summary conviction to a fine not exceeding €5,000 or to imprisonment for a term not exceeding 6 months or to both. (5) In a prosecution for an offence under this Part it shall be presumed, until the contrary is shown, that an apparatus provided by a member of the Garda Síochána for the purpose of enabling a person to provide 2 specimens of breath under this section is an apparatus for determining the concentration of alcohol in the breath. 22.— (1) In a prosecution of a person for an offence under section 12 for refusing or failing to comply with a requirement to provide 2 specimens of his or her breath, it shall be a defence for the defendant to satisfy the court that there was a special and substantial reason for his or her refusal or failure and that, as soon as practicable after the refusal or failure concerned, he or she complied (or offered, but was not called upon, to comply) with a requirement under the section concerned in relation to the taking of a specimen of blood or the provision of a specimen of urine. (2) In a prosecution of a person for an offence under section 12 or 14 for refusing or failing to comply with a requirement to permit a designated doctor or designated nurse to take a specimen of blood or for refusing or failing to comply with a requirement of a designated doctor or designated nurse in relation to the taking of a specimen of blood, it shall be a defence for the defendant to satisfy the court that there was a special and substantial reason for his or her refusal or failure and that, as soon as practicable after the refusal or failure concerned, he or she complied (or offered, but was not called upon, to comply) with a requirement under the section concerned in relation to the provision of a specimen of urine. (3) Notwithstanding subsections (1) and (2), evidence may be given at the hearing of a charge of an offence under section 4 or 5 that the defendant refused or failed to comply with a requirement to provide 2 specimens of his or her breath, or that the defendant refused or failed to comply with a requirement to permit the taking of a specimen of his or her blood or to comply with a requirement of a designated doctor in relation to the taking of a specimen of blood, as the case may be. (4) In a prosecution for an offence under section 11 (4) for refusing or failing to perform a test, it is a defence for the defendant to satisfy the court that there was a special and substantial reason for his or her refusal or failure and that, as soon as practicable after the refusal or failure concerned, he or she complied (or offered, but was not called upon, to comply) with a requirement under the provision concerned in relation to the performance of a test. (5) Notwithstanding subsection (4), evidence may be given at the hearing of a charge of an offence under section 4 , 5 or 6 of the Road Traffic Act 2010 that the defendant failed to comply with a requirement to perform a test. The Supreme Court, in DPP v Maresa Cagney, has held there is an obligation on the Garda to warn the person that if they want to rely on this defence of having a special and substantial reason for failing to provide breath, the person must offer to provide blood or urine. (4) A member of the Garda Síochána may, for the purpose of making a requirement of a person under subsection (1), enter without warrant any hospital where the person is or where the member, with reasonable cause, suspects him or her to be. (5) A designated doctor or designated nurse may, for the purpose of taking from a person a specimen of his or her blood or being provided by a person with a specimen or his or her urine under subsection (1) enter any hospital where the person is or where the doctor or nurse is informed by a member of the Garda Síochána that the person is. Section 29 of the Road Traffic Act, 2010 introduces a fixed penalty notice system for drink driving offences. Specified persons and non-specified persons must be served with a fixed penalty notice, depending on their driving licence status and the concentration of alcohol in his/her body. he or she shall, subject to subsections (4) and (5), be served with a notice (“fixed penalty notice”) in accordance with subsection (10) stating that where the charge specified in subsection (7) (“fixed charge”) is paid in accordance with this section and the penalty points specified in subsection (8)(a)(i) or disqualification specified in subsection (8)(a)(ii) for the person holding a driving licence is in consequence applicable, a prosecution in respect of any such offence shall not be initiated against him or her. he or she shall, subject to subsections (4) and (5), be served with a notice (“fixed penalty notice”) in accordance with subsection (10) stating that where the charge specified in subsection (7) (“fixed charge”) is paid in accordance with this section and disqualification specified in subsection (8)(b) for the specified person holding a driving licence is in consequence applicable, a prosecution in respect of any such offence shall not be initiated against him or her. (iii) at which the vehicle is registered, where the person is the registered owner of the vehicle at the time of the alleged offence. (4) A person is not eligible to be served with a fixed penalty notice if he or she does not hold a driving licence for the time being in force or is disqualified for holding a driving licence, at the time of the commission of the alleged offence. (5) A person who has been served with a fixed penalty notice and has paid the fixed charge, is not eligible to be served with another fixed penalty notice within the period of 3 years from the appropriate date relating to the endorsement of penalty points on the entry relating to the person or the date of commencement of the disqualification, whichever is applicable, following payment of the fixed charge in accordance with the notice. (6) Penalty points so endorsed on the entry relating to a person (who is not a specified person) shall, in accordance with section 4 of the Act of 2002, remain on the entry for a period of 3 years beginning on the appropriate date. or such other amount that, for the time being, stands prescribed in lieu of either of those amounts. (b) a specified person, who is eligible under subsection (2) to be served with a fixed penalty notice, pays the fixed charge and payment is made in accordance with this section, he or she shall be disqualified for holding a driving licence for a period of 3 months beginning on the date referred to in subsection (14). (9) Where a member of the Garda Síochána alleges that a person has committed an offence referred to in subsection (1) or (2) and the person under this section is eligible to be served with a fixed penalty notice, the member shall serve or cause to be served in the manner referred to in section 35 , personally or by post, on that person a fixed penalty notice. (c) may specify the person to whom and the place where the payment is to be made and whether the payment is to be accompanied by the notice, duly completed. (f) unless the person is not eligible under this section to pay the fixed charge, a prosecution in respect of the alleged offence will not be initiated during the period specified in paragraph (d) or, if payment of the fixed charge accompanied by the notice, duly completed, is made during that period, at all. (12) A person who is ineligible under subsection (4) or (5) to pay the fixed charge, and who knows or should in the circumstances have reasonably known that he or she is so ineligible, who pays or attempts to pay the charge commits an offence and is liable on summary conviction to a fine not exceeding €5,000 or to imprisonment for a term not exceeding 1 month or to both. (13) (a) Where the fixed charge is paid in accordance with this section, a receipt for it shall be issued by the Garda Síochána to the person who has paid the charge. (b) Subject to paragraph (c), the payment of the fixed charge received by the Garda Síochána in accordance with this section shall be paid into or disposed of for the benefit of the Exchequer in such manner as the Minister for Finance directs and shall not be recoverable by the person who made it. (c) Where a person who is ineligible under subsection (4) or (5) to pay the fixed charge pays the charge, the Garda Síochána may return the payment to the person. (14) Where a payment is received under subsection (13), the Commissioner shall, as soon as may be after the payment, cause the Minister to be notified of the payment and thereupon the Minister shall cause the number of penalty points or period of the disqualification referred to in subsection (8), as the case may be, to be endorsed on the entry in the licence record relating to the person. (15) Where an endorsement which is a disqualification is made under subsection (14), the Minister shall cause a notice to be issued to the person concerned informing him or her that the date for the commencement of the period of the disqualification is 14 days after the date of that notice or where penalty points are to be endorsed, that 3 points have been endorsed on the entry relating to the person and will remain, subject to section 3(2) of the Act of 2002, on the entry for a period of 3 years beginning on the appropriate date. within 14 days of the date of the notice. (17) A person who does not comply with a direction under subsection (16) commits an offence and is liable on summary conviction to a fine not exceeding €2,000. (b) a payment under the relevant fixed penalty notice, accompanied by the notice, duly completed, has not been made. (19) (a) The Minister for Justice and Law Reform may by an agreement in writing entered into with any person, upon such terms and conditions as may be specified in the agreement, provide for the performance by that person of any of the functions of a member of the Garda Síochána relating to the issuing of a fixed penalty notice, the receipt of such notice, the acceptance of a payment or the issuing of a receipt for such payment, as are set out in this section or of the function of the Commissioner in respect of the issue of a notice under subsection (9). (b) An agreement referred to in paragraph (a) may apply to the performance of all or any of the functions to which that paragraph refers in respect of all or selected offences in respect of which this section applies. (c) Section 14(2), (3) and (4) of the Act of 2002 applies to any agreement entered into by the Minister for Justice and Law Reform under paragraph (a). (20) In this section, reference to a fixed penalty notice, duly completed, is reference to such a notice on which the number, the date of the grant, and the period of validity, of the driving licence of the person to whom the notice relates, as required in the notice, have been inserted by or on behalf of the person. (21) In this section “driving licence” includes a learner permit. The periods above are minimum disqualifications; the Court has discretion to impose longer disqualification periods, depending on the circumstances. The prosecution of drink driving offences can be a technical area, particularly from an evidential perspective. Being convicted of drink driving will obviously create significant difficulties for you, and may even lead to the loss of employment, not to mention other difficulties in your day to day life. There is a mandatory disqualification if you are convicted, with the Court having no discretion as to the disqualification. Therefore, you should almost certainly consider obtaining legal advice to look at your options and the strength of the case against you before deciding to plea guilty or not.